One of Teekay Shipping's shuttle tankers arrived yesterday evening on the Firth of Clyde, anchoring in the lower firth until this morning. 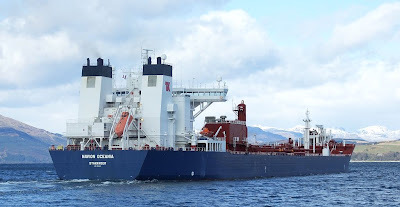 NAVION OCEANIA, built in 1999 by Astilleros de Sestao at Bilbao in Spain, moved up-firth early this afternoon heading for Finnart to discharge her cargo of crude oil. She has a deadweight of 126,355 tonnes and an overall length of 264.68 metres. Registered on the Norwegian International register, she is manned by a Scandinavian crew. She is owned by Navion Offshore, now a Teekay subsidiary but previously part of the Norwegian Statoil company.